Do you know Bhilwara is the same city where the aadhar card of Osama Bin Laden, the dead terrorist, was generated a few years ago? Even though, the exact source to prove this information has still not been found, the rumours are still alive. However, Bhilwara is a beautiful yet unexplored city which deserves to be visited by every traveller on account of its gorgeous tourist spots. From lakes to temples and historical monuments to other natural sites, there are numerous places which will certainly surprise you with their beauty. As per records, the city has derived its name from the local tribe named Bhil. It is said that this local tribe helped Maharana Pratap in a war against the Mughal Emperor Akbar in the late 16th century. Today, it is one of the largest cities in Rajasthan and is frequented by hundreds of local tourists every year. Read on to know more about Bhilwara and how to reach it. Bhilwara has a semi-arid climate and hence, summers are extremely hot, due to which, it is not a preferred destination during the summer season. The best time to visit Bhilwara is from October until the end of March. During this period, the weather is cool and pleasant, thereby, letting you explore its beauty comfortably. However, for history lovers, it remains a year-round destination. By Air: Bhilwara doesn't have an airport of its own and hence, you need to catch a flight to Udaipur airport, which is located at a distance of about 145 km from the city, and from there, a bus or cab to Bhilwara. It will take you an approximate time of 3 h to reach Bhilwara from Udaipur. By Rail: Bhilwara is well connected to all other major cities and towns by rail and hence, you can catch a direct train from Jaipur railway station to Bhilwara Junction. It will take you an average time of 4 h to reach your destination. By Road: Bhilwara has a good road system and therefore, you can easily approach it by road. The best and the fastest way to reach Bhilwara is via route 1, as it will take an average time of 4 h, i.e., 1 h lesser in comparison to the other route. On your way, you can also visit Bijainagar and Kishangarh and explore their historical as well as natural places. Kishangarh is located at a distance of about 100 km from Jaipur and 155 km from Bhilwara and is a perfect spot for a break as there is a lot to explore within its boundaries. As per historical records, this ancient settlement was established by a prince of Jodhpur in the early 17th century and since then, it has been a major city in Rajasthan. Today, it is also known as the marble city of India on account of its large production of marbles. From lakes to forts and palaces to temples, there are several places to savour here. The prominent ones include Kishangarh Fort, Khoda Ganesh Temple, Gondulav Lake and Phool Mahal Palace. Another beauty lying on your way to Bhilwara, Bijainagar is located in the Ajmer district on the banks of Khari river and is popular amongst local tourists for its religious sites and several temples. Therefore, sometimes it is also referred to as the temple town. The major temples and religious sites here include Ganesh Mandir, Chamatkari Mandir, Laxmi Narayan Mandir, Shiv Mandir and Balaji Temple. These temples are characterised by a peaceful environment and a positive ambience. 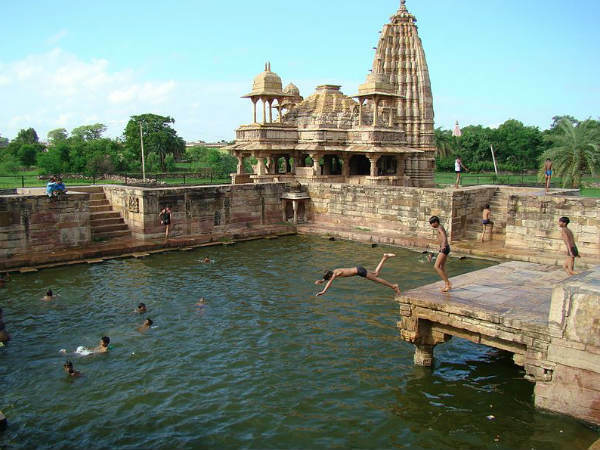 Bijainagar is located at a distance of about 75 km from Bhilwara and 180 km from Jaipur. Bhilwara is located at a distance of about 250 km from Jaipur and is a must-visit destination for every traveller who always looks forward to unveiling hidden beauties. So, if you are one amongst these type of travellers, then you must plan a trip to this historic city now. Following are the major places to visit in Bhilwara. One of the most popular destinations in Bhilwara, Kyara Ke Balaji is a beautiful temple dedicated to Lord Hanuman. As per local legends, it is believed that the image of Lord Hanuman kept inside the temple emerged overnight on a rock several centuries ago. Since then, it has been a prominent religious site in the city. Today, it is visited by thousands of locals and tourists every year. How about getting yourself to this interesting temple and witnessing the natural image of Lord Hanuman? Another must-visit tourist spot, Pur Udan Chatri is a beautiful cenotaph overlooking the core settlement of the city. It is constructed on a small hillock and offers a panoramic beauty of the city. Therefore, it is certainly one of the most photogenic places in Bhilwara. Even though its exact history is still unknown, it is said to have been constructed several centuries ago when Bhilwara was under the reign of the Rajput kings. If you desire to feel serenity and divinity simultaneously, then Harni Mahadev is one place you should visit on your trip to Bhilwara. Dedicated to Lord Shiva, this temple is one of the highly revered sites in the city and is visited by people from the nearby towns and villages. Once you are done with exploring the history of Bhilwara and are in need of soothing your mind amidst a peaceful atmosphere, then you must visit the beautiful lakes in Bhilwara. The most popular ones here include Gandhi Sagar Talab and Mansarovar Lake. Apart from the above-given places, you can also visit Bagore, Shivaji Garden, Badnore Fort, Mandalgarh Fort and Shahpura.